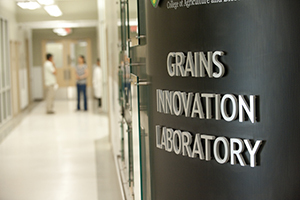 The Grains Innovation Laboratory (GIL) is a 1,466 m2 grain quality screening laboratory. The lab comprises a baking facility for wheat, a malting facility for testing malt characteristics of experimental barley lines, a wet chemistry facility for assessing the characteristics of all new crop lines, a milling room, a grinding room, additional storage, office and support space and a new drying facility to dry down crops that are harvested from the research plots. The Wet Chemistry Laboratory within the Grains Innovation Laboratory provides in-house support to the barley, oat, flax, pulse, wheat, durum and special crops breeding programs of the Crop Development Centre. Tens of thousands of breeding lines are evaluated yearly for their specific nutritional and functional requirements through a wide array of quality-related chemical and spectral analyses. Advanced breeding material and multi-site research trials benefit from the in-depth chemical analyses while early generation material benefits from earlier screening using Near Infrared Technology to predict important criteria. Improving the end-use performance of the crop, both functionally and nutritionally, is paramount to the mandate of the CDC and the GIL is well equipped to meet this mission. To assist with functional needs, the Wet Chemistry Laboratory has equipment such as the RVA (Rapid Visco Analyzer) for assessing starch functionality in wheat, soluble fibre functionality in food barley, and pre-harvest sprouting resistance in malting barley. Similarly, enzyme activity of wheat and starch functionality of wheat and food barley is evaluated colorimetrically with the aid of a spectrophotometer. An automated Mattson cooker allows selection for reduced cooking times in pulse crops. To select optimal protein levels for potential new malting barley varieties, and other roles in other crop species, a Leco Protein Analyzer is available for use. Improving the nutritional value of the crop, both for food and feed purposes, is a similarly important focus. In oat and food barley, beta-glucan (the cholesterol lowering soluble fibre) is determined by flow-injection analysis whereas in oat and pulse crops, total dietary fibre (TDF) is analyzed conveniently using the Ankom Automated TDF Analyzer. Healthy oil is a key requirement of flax development and a growing interest in oat, determined by fatty acid profiles through gas chromatography with quantification of oil performed by the Ankom Extraction System. Selecting lines with improved phosphorus bioavailability in pea and feed barley is accomplished colorimetrically with the aid of an in-house spectrophotometer. Increasing the feed value and therefore economic value of presumably worthless oat hulls is obtained with the help of an Ankom Fibre Analyzer. Fusarium Head Blight deoxynivalenol (DON) vomitoxin screening is possible, with the aid of an enzyme-linked immunosorbent assay and spectrophotometry. The Wet Chemistry Lab houses a number of Near Infrared Reflectance (NIR) and Near Infrared Transmittance (NIT) spectrophotometers, as also found in the Wheat/Durum Lab, capable of predicting chemical constituents on whole seed – vital to early-generation selection but useful throughout breeding stages. In unmalted barley, these instruments together predict protein, oil, and beta-glucan content. In whole oat, the NIT gathers information on groat protein, oil, and fatty acid content, groat percentage and hull lignin content; in dehulled oat, the NIR predicts beta-glucan levels. NIR also screens whole flax seed for oil and protein content and iodine value. For peas, NIR predicts feed components like crude protein, acid detergent fibre (ADF), neutral detergent fibre (NDF), starch, oil, and ash content. For ground malted barley, the NIR sheds light on various malt barley parameters including alpha-amylase activity, diastatic power, malt protein, free amino nitrogen and malt beta-glucan content, malt extract and friability. NIR also provides information about deoxynivalenol (DON) vomitoxin levels in ground barley seed, with work continuing on developing calibrations for wheat and durum DON prediction. Calibration development to improve predictions or add new constituents is an important complement to the chemical analyses performed in the Wet Chemistry Lab. The Wheat/Durum Quality Lab of the Grains Innovation Laboratory supports the wheat and durum breeding programs through ongoing testing of early generation breeder lines, advanced multi-site yield trials as well as various research trials. Early generation screening of thousands of lines are carried out, with many technicians working in the lab during the winter months. Several NIR (near infrared reflectance) machines are in place to predict whole grain protein and yellow pigment content of ground durum samples. Other tests include the Falling Number (sprout damage), the SDS-Sedimention test (indicator of potential baking quality) and Gluten Index (gluten strength of durum wheat). For advanced material, more indepth quality analysis is performed. Both the hardness of the grain (SKCS) and its PPO activity (polyphenol oxidase enzyme) are measured. Milling performance is evaluated, with bread wheat milled to flour and durum wheat milled to semolina. Bread wheat flour is evaluated for protein content (Leco analysis), ash content, colour (Agtron, CIElab), mixing strength/water absorption capacity (Farinograph) and finally baking performance. The bake lab area of the lab, which houses two different mixers, a sheeter/roller, fermentation cabinet and oven, is a busy place used to produce white pan bread, french bread as well as cakes and cookies when required. For durum wheat, the semolina is evaluated for protein, ash and yellow pigment content, dough sheet colour and gluten strength (Gluten Index and Glutograph). Alveographs may be run on select lines as a further indication of gluten strength. Currently, a pasta extruder and pasta drier are being setup and tested in order that advanced durum lines and research material can be evaluated for pasta quality (colour and cooking quality). The large amount of data provided to the breeders assists them in selecting lines with superior end-use quality and potential for variety registration. The Malting Laboratory within the Grains Innovation Laboratory provides the tools needed to evaluate thousands of potential malting barley breeding lines for malt performance. Using two on-site automated micromalters, preliminary and advanced malted barley lines are analyzed for extent of modification using Pfeuffer’s Friabilimeter and level of hot water extract by an Anton Paar Density Meter. A newly purchased malt mashing bath for hot water extract will give a more accurate measure of extract. Additional malt constituents, specifically alpha-amylase activity, diastatic power, free amino nitrogen and malt beta-glucan, are measured using the Skalar continuous flow analyzer. Screening of early generation material is accomplished with the help of the NIR for predictions of the above traits. The Grains Innovation Laboratory has excellent facilities for grinding and milling. One room houses several UDY grinders, wiley grinders and a Satake mill. Tens of thousands of samples from a wide array of crop types are ground here to provide material for the many different quality analysis performed. The milling room is used to produce flour and semolina for the wheat and durum breeding programs. There is an experimental Buhler mill as well as two Brabender Quadrumat Junior mills. One of these is used for a majority of the bread wheat milling. The other one is equipped with semolina rolls. A durum milling protocol was developed several years ago, which involves producing coarse semolina on one mill, sieving/sizing using a Retsch sieve shaker, and reduction of particle size of the very coarse semolina using the flour mill. A Chopin laboratory purifier is used to clean out the fine branny particles from the semolina, to produce a clean, bright product which can be further tested for end-product quality.